Jena Sinclair had taught him a couple of things about himself in the past few minutes that he didn’t want to know. First, sometime in the past five years, a deep fatigue had wrapped itself around him – not the fatigue that could be slept off with a soft bed and a warm blanket, but the fatigue caused by a tightened harness that restricted. That promised no end to long days and longer nights. A harness of his own making. Cole had realized another surprising thing too. Very surprising for the man who needed nothing and no one. If you are looking for an utterly fabulous gripping romantic suspense read, I’d highly recommend that you check out Susannah Sandlin’s BLACK DIAMOND! Susannah Sandlin is a pseudonym of Suzanne Johnson. When Suzanne writes as Susannah Sandlin, her stories of romantic suspense and paranormal romance are typically set in the Deep South where there are things that go bump in the night. BLACK DIAMOND is set in the Terrebonne Parish bayous of Louisiana where dangers often lurk unseen until it’s too late. 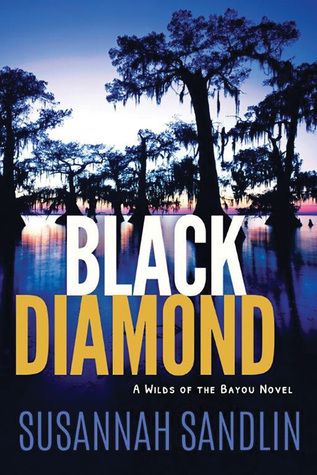 BLACK DIAMOND is the second installment in Susannah’s breathtaking Wilds of the Bayou series. It can work well as a stand-alone, if that is your preference as Susannah seamlessly integrates any needed information from the first book into this one. However, just know that the first book, WILD MAN’S CURSE, is just as terrific as this one, and that some of the characters in BLACK DIAMOND are first introduced in WILD MAN’S CURSE. This is the story of two characters carrying a world of hurt on their shoulders: Louisiana wildlife agent Jena Sinclair and handsome recluse Cole Ryan. In the last book, Jena was gravely injured inside and out, when Celestine, the sole heir of murdered voodoo priestess Eva Savoie, was kidnapped while under Jena’s protection. Jena still blames herself for what ensued. As this story begins, Jena has returned to work on light duty. While on assignment with her new partner, Mac, they discover a man’s body which had been mauled by an alligator. Then, while investigating a report of a rogue alligator acting oddly, she meets Cole Ryan and leaves him her card in case he remembers any information that may help with their case. Cole does call her – but it’s about another alligator – a big, dead one. Meanwhile there is a new terrifying drug circulating through Terrebonne Parish called Black Diamond. If you have ever read one of Susannah’s books, you know to expect plenty of heat and thrilling edge-of-your-seat action sequences. She writes with such vivid imagery, that the reader is transported into the setting with the characters. BLACK DIAMOND’S hero and heroine are broken, yet strong. Their story is beautifully written. Will Jena and Cole find a way to work together to live another day and to heal their emotional wounds? Pick up this book, strap yourself in, and hold on for a riveting roller coaster ride. I was very fortunate to read two spectacular, well-executed, nontraditional romantic thrillers back-to-back – both by favorite authors. I would not hesitate to read either of them again. BLACK DIAMOND was one of them and it is a strong contender for one of my top ten reads this year. I can’t wait to read Susannah’s next installment in this series.